Contemporary Research has added TV Control Panels to its Display Express TV management system. 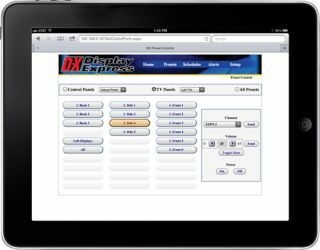 Display Express features Web-based forms and control pages that allow users to define and update system operation, automated presets, scheduling and Web control panels that are easily accessed on PCs and Internet-driven tablets. By adding user-defined TV Control Panels, Display Express offers a cost-effective solution for sports bars, casinos, and corporate applications. To control any TV, the user can touch a TV icon (which can represent one or a group of TVs), select a channel, change volume, or turn power on and off. One or more pages can be assigned to any number of users, each with a unique login and password. The key values are that the facility can adapt the system and create and assign new panels without hiring a system programmer. Any tablet driven by iOS, Android, or Windows can be used as a touch panel. No additional wiring is needed to integrate Display Express technology. The software can be installed on a Windows 7 Pro PC, system operation pages are accessed over the network, and the control commands travel over the existing RF coax system. Developer Jennifer Oppenheim notes, "Display Express has always been a crowd-sourced technology. A number of our integrators and end users suggested the concept, and we implemented the new feature in just a few weeks. In addition to new sites, our existing base of users can add the new feature with a free update."